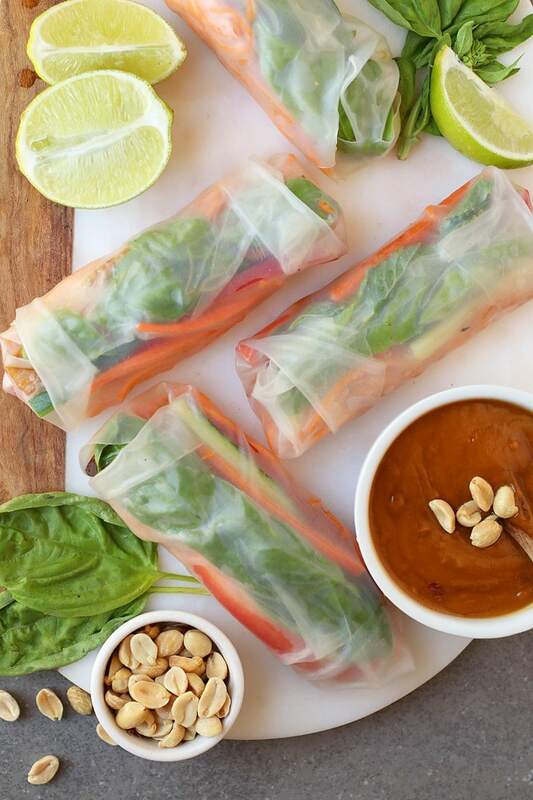 Vietnamese-style vegan spring rolls made with sweet potato noodles and ginger peanut tempeh for a light and refreshing plant-based, gluten-free snack. Made in just 20 minutes! Peel the sweet potato. Then using your spiralizer with its smallest blade, spiralize the sweet potato into thin noodles. In a large skillet, heat 1 tbsp of sesame oil over medium heat. Add sweet potato noodles and lightly sauté for 3-4 minutes until the noodles are deep orange in color and soft enough to bite into. Remove from heat and set aside. Wipe clean the skillet and heat the remaining sesame oil over medium heat. While oil is heating, cut the tempeh into 1"x1/2" rectangles. Add tempeh to hot oil - it should sizzle when they drop - and sauté for 4-5 minutes, stirring occasionally, until tempeh is browned. Add soy sauce and maple syrup and continue to sauté until all the liquid has absorbed. Remove from heat and set aside to cool. Prepare your vegetables. De-stem the mint and basil but keep it whole. To make the rice noodles, fill a shallow pie dish with warm water. Place one rice paper wrapper in the water for 15-20 seconds until the wrapper is pliable but not so soft that it rips. Place pliable wrapper on a dry surface. On the bottom 1/3 of the wrapper, place 1 small handful of sweet potato noodles leaving 1" on each side. Top with 2-3 pieces of sautéed tempeh, vegetables, and herbs. Fold in the sides and the bottom over the filling. Then wrap the spring roll as tightly as you can without ripping. Set aside and continue with the remaining 5 spring rolls. Serve immediately with Thai Peanut Sauce or wrap in plastic wrap and place in the refrigerator until ready to serve.